Many of our clients who were initially hesitant about hiring our Aspen limo service go on to say that they loved it so much, they plan on hiring us during every visit. That’s the kind of feedback that we love to hear! Our goal is to help make our clients lives easier, whether that’s on an airport transfer or just making your way from one resort to another or enjoying a night out on the town. 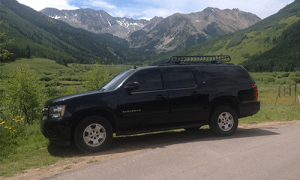 If you are thinking about hiring a private car service in the Aspen area but aren’t sure it’s the right choice yet, we wanted to share some of the reasons our customers think it’s absolutely worth hiring our limo service. You don’t have to drive in bad weather. Aspen is located high in the Rocky Mountains, where we get over 175 inches of snow every year. A lot of that snow ends up on our roads, and while the Colorado Department of Transportation does an amazing job of keeping our roads clear, if you aren’t experienced at driving on snow and ice it’s not something you want to jump right into. Our drivers have years of experience handling vehicles in the harshest condition, so you can sit back and relax and enjoy the view while they safely deliver you to your destination. It could actually save you money. Depending on how much you’ll be driving and what kind of vehicle you rent, hiring our Aspen limo service could actually save you money. Car rentals can be expensive, especially when you add in the cost of insurance and filling up your gas tank. When you sit down and look at the numbers, a limo service could actually save you money, giving you more cash to spend in Aspen’s incredible restaurants or souvenirs for your family. No easier way to get to or from the airport. We offer the easiest way to get to the airport of your choice. Instead of dealing with shuttles, buses, or even the train, our airport transportation service picks you up at your home or hotel and delivers you right to the terminal. Our drivers make trips to all major Colorado airports, so we’re very familiar with each one and know where you need to go to get checked in for your flight. It takes a lot of the stress out of the start and end of your Aspen trip when you allow our drivers to get you there! If you’ve been considering a limo service during your next visit, now is the time to call ZG Limo Service. We’d love to help you get the most out of your visit to the Aspen area, whether you are here for business or pleasure, and safely delivery you to all of your destinations. Get in touch with our team today to learn more about our services and to book your transportation. You can do that by giving us a call at 970-309-1680 or contacting us through our website.